Square-Enix’s Play Arts Kai DC figures have turned Batman into all sorts of crazy things—cowboys, a giant robo-dragon, a samurai, the list goes on—but now they’re turning him into his own villains, starting with this wonderful Two-Face mashup. Yes, you can never have enough Batman variants according to Square-Enix, who revealed this past weekend at San Diego Comic-Con that their latest spinoff DC line will see the Dark Knight fused with his eclectic gallery of rogues, starting with Two-Face. 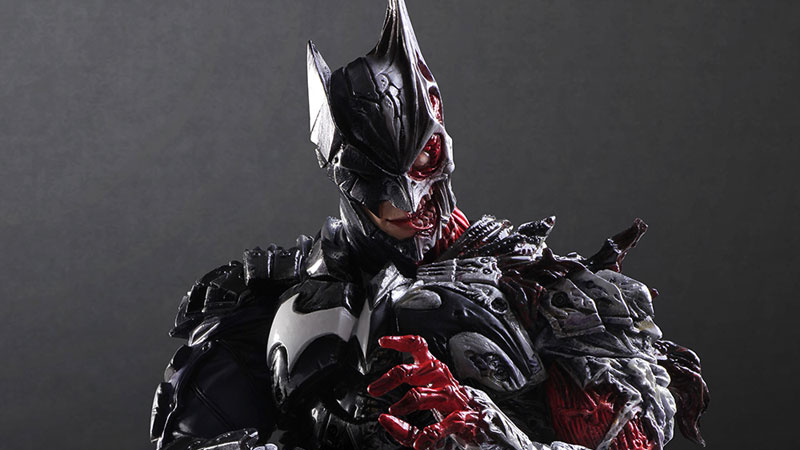 So yes, it’s one half of a perfectly normal Batman figure, and the other is all gnarly and burned up—whether it’s his face, his body, even his cape. Even his batarang is half-normal, half-gnarly. Dedication to a theme right there, Bats. The Two-Face Batman will be out in November in Japan, and will come with a rather insane Batman-tax, as all of Play Arts Kai’s Batman figures do—except this one is particularly egregious, as it’ll set you back a whopping 21,384 yen (about $200). That’s more than a few of Harvey Dent’s silver dollars.